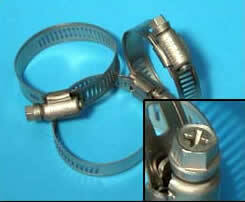 Titanium hose clamps are specialty use clamps usually implemented in high-end applications. The first domain is the racing field. The motorists are always looking for reducing weight, this being a critical factor for achieving the best performances. However, the notion of using such titanium parts in a race car would make most racers wonder about one’s sanity. The reduction in weight might allow for a mere a 0.0001% increase in total speed, making saving weight a poor reason for moving to titanium. There are other advantages for such a bold move. First, there is the elimination of rust and corrosion. When you consider that the price of a titanium hose clamp is only slightly higher than a similar “stainless steel” hose clamp and much less than two stainless steel clamps, the beauty of the this purchase begins to show. When you consider the future replacement costs, they cost less in the long run. Second, there is the elimination of salt water related electrolysis. Salt water reveals the next big application for titanium hose clamps. More precisely, naval or naval related devices. Generally speaking, metal-based spring clamps are commonly employed to connect a hose to a connector. It is clear that its main function is to be properly connected to avoid potential leaks. It sometimes may not be easy to ascertain visually whether the clamp has been tightened to a degree effective to prevent leakage. More over, even if adequately tightened during the initial assembly process in an amount effective to prevent leakage, it is possible that a clamp may loosen due to the vibrations of the operating environment. 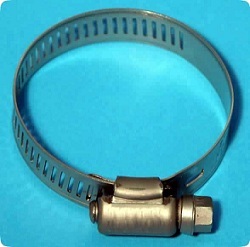 Still further, for automotive applications, these types of clamps may often used for connecting radiator hoses to a radiator inlet which is subject to extensive thermal cycling. The solution devised for these scenarios consists in titanium based shape memory alloys hose clamps. Sounds really cool, isn’t it? A typical application would be a ring-shaped clamp containing the pre-strained shape memory alloy that is placed embedded or around the hose connection region. This “smart clamp” can be open, closed on in spiral form, but sized for a particular hose diameter. At the moment of placement, the shape memory alloy is in its cold state and it can be deformed so it can be connected to the fitting. Fastening occurs by increasing the temperature of the shape memory alloy to its hot state shrinking the smart clamp. The clamping force can be maintained either by heat from the fluid or the environment - heat from the coolant inside the hose or from the engine - which forces the shape memory alloy to shrink in service. The temperature at which the titanium hose clamp with shape memory alloy remembers its high temperature form when heated, can be adjusted by slight changes in the composition of the alloy and through thermo-mechanical processing. In nickel-titanium shape memory alloys, for example, it can be changed from above about 270° C. to below about −100° C.
The shape recovery process can occur over a range of just a few degrees or exhibit a more gradual recovery. The start or finish of the transformation can be controlled to within a degree or two depending on the desired application and alloy composition. The mechanical properties of the shape memory alloy vary greatly over the temperature range spanning their transformation, providing shape memory effect, super elastic effect, and high damping capacity.